Articles by "Strange But True"
Some strange but true things you might or might not have known before reading this article. They both excel on vault, their first names are almost spelled the same and they share the same birthday which is December 9th. Maroney was born in 1995, exactly a year before Skinner. All of these four gymnasts have the same amount of gold medals which is two. Raisman and Douglas won both their gold medals in team competitions, Afanasyeva won her first gold with her team while her second one was won on floor exercise, Komova won both her gold medals on uneven bars. Mustafina, Maroney and Kocian have earned a total of three World gold medals. Mustafina's gold medals were won in team competition, all around and balance beam final,, Maroney's were in two vault finals and in a team competition. while Kocian's were won in two team competitions and in an uneven bars final. 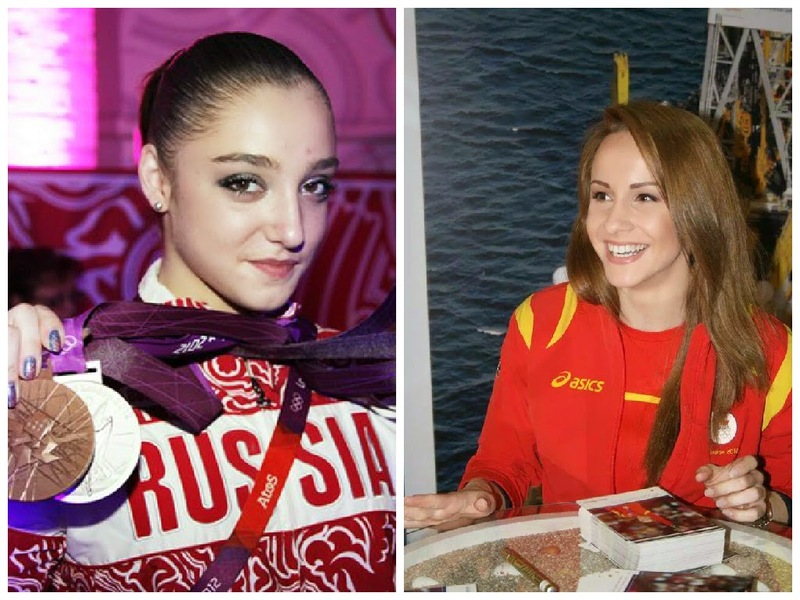 Russia's Aliya Mustafina was born on September 30th hence sharing birthday with Olympic all around champion Andreea Raducan of Romania and US Dominic Moceanu who was part of the 1996 Olympic gold winning team. The all around is the most prestigious competition in the sport yet only those who earned medals in individual event finals at the same time their country did not advance to team final at the pre Olympic World championships, earn their ticket to the Olympic games. So has Larisa earned her medal on any of the four events she would have directly qualified to the Olympics but since her medal was earned in the all around, she will have to earn her ticket to the Olympics at the test event. As we all know since their is no tie breaking rule but at the Olympics, US Madison Kocian, China's Fan Yilin, Russia's Viktoria Komova and her teammate Daria Spiridonova tied for the gold at 2015 Worlds. If the outcome of the final had happened in the Olympics, Fan Yilin would have finished in 4th place, Spiridonova would have settled for the bronze while Komova and Kocian would have tied for gold. At the Olympics, the ties breaking rule states that if two or more gymnasts had the same over all score, the gymnast with the higher E-score prevails. However, if they had the same D & E scores, they share the same placement. Komova and Kocian shared the same D and E scores while Yilin had the lowest E score among the gold medalists. All three have won a total of five medals including one gold at Worlds. Ferrari won her gold at 2006 Worlds' AA final, Jinnan won hers at 2014 Worlds' uneven bars final while Ross won hers at 2014 Worlds' team competition final. Ferrari has silver and three bronze medals in her record, Jinna has two silver and two bronze medals and Ross has three silver and one bronze medal. At 2001 World championships, Russia's Natalia Ziganshina and Romania's Andreea Raducan used the same exact floor music which was "Eclipse" from album Nouvelle Experience by Cirque Du Soleil. The elite gymnasts competed against each other during the individual all around final where Ziganshina won silver and Raducan won bronze. Both gymnasts opened their floor routine with the same exact tumbling pass, a full twisting double back tuck rated an E in the current CoP as well as ending their routine with the same D rated double back pike. For their second tumbling pass, Ziganshina competed a double full and a half twisting layout (D) to a full twisting forward tuck (B) while Raducan competed a triple full (E). As for their third tumbling pass, Ziganshina competed a whip (B) to triple full (E) while Raducan competed a two and a half twisting layout (D) to forward layout (A). The Russian gymnast competed more difficult tumbling passes than Raducan but had more trouble on her landing. Ziganshina scored higher than Raducan by a little more than a tenth of a point. The first scored a 9.387 while the latter scored a 9.262. The gold medal at the championships was won by Russia's Svetlana Khorkina which was the second of three of her World all around titles. After the all around final, Andreea won bronze on vault and gold on floor exercise and balance beam. Natalia did not qualify to any event finals. Last Strange But True post, we wrote about how Sandra Izbasa scored higher than Russia's Aliya Mustafina on three of the four events during the all around competition at London Olympics, yet Sandra finished out of the podium in fifth place while Aliya took home a bronze medal. In this post we are going to write about how the same exact thing happened to Russia's Anna Pavlova who finished in seventh place and China's Yang Yilin who won bronze four years earlier at Beijing Olympics. Pavlova and Yilin both had the same vaults, a double twisting Yurchenko. Pavlova who is the 2004 Olympic bronze medalist on the event, scored higher than Yilin by one tenth of a point. Just like Mustafina, Yilin had the highest score in that night on uneven bars, a 16.725. Pavlova on the other hand received a mediocre score of 14.525. It is worth to mention that the difference between Yilin's and Pavlova's uneven bars scores is exactly the same as Izbasa's and Mustafina's, which was 2.2 points, and as well as the difference between their vault scores which was 0.1. On balance beam, the Russian gymnast received a higher score than the Chinese gymnast by 0.225. While on floor exercise, the first scored higher than the second by a small margin of 0.050. The comparison between the difference of scores of both finals. The comparison between the apparatus placements between Izbasa and Pavlova. Izbasa and Pavlova both had the highest seventeenth score on bars during the competition. The difference between the total scores: Izbasa/Mustafina 0.733, Yilin/Pavlova 2.558. Pavlova also scored on three out of four events higher than fourth placer teammate Ksenia Semenova, fifth placer Steliana Nistor of Romania and sixth placer Jiang Yuyuan of China. -Yilin and Mustafina had the highest score on uneven bars in that night. -Izbasa and Pavlova were both competing in their second Olympics. -Yilin and Mustafina were both competing in their first Olympics. -The difference of scores between Mustafina and Izbasa on vault is exactly the same as Yilin's and Pavlova's. -The difference of scores between Mustafina and Izbasa on bars is exactly the same as Yilin's and Pavlova's. -Izbasa and Pavlova both had the highest seventeenth score on bars. -Both Yilin and Mustafina went on to win their third Olympic medal on uneven bars during the event final. -Both Izbasa and Pavlova qualified to the vault and floor event final. At 2012 London Olympics, Romania's Sandra Izbasa who placed fifth in the all around, out scored Russia's Aliya Mustafina who won the bronze medal on three of the four events. On vault, Izbasa had a higher D score. She competed a round off half on full out which is worth 6.1 D score while Mustafina competed a double twisting Yurchenko which is worth 5.8 D score. Izbasa scored 15.333 and Mustafina scored 15.233. The uneven bars was the only apparatus that Mustafina scored higher than Izbasa on. The Russian gymnast scored a 16.1 which was the highest score in that night. A low score of 13.900 was scored by the Romanian gymnast whose weakest apparatus is the uneven bars. On balance beam, Mustafina suffered a fall,which could have caused her, her bronze medal. She received a score of 13.633. Izbasa scored 0.767 points higher than Mustafina. 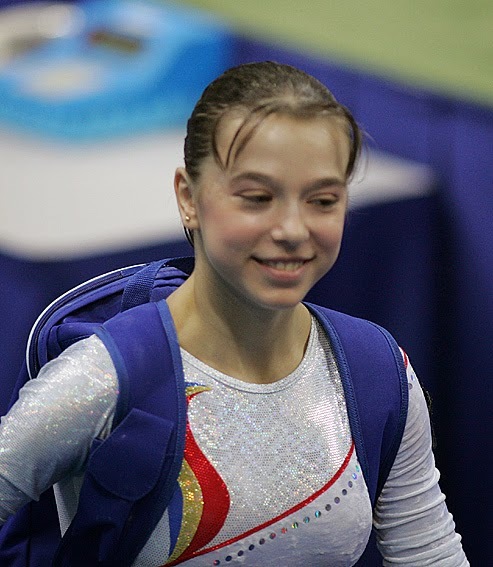 Izbasa who is the 2008 Olympic floor champion, had the highest score on that event in the competition while Mustafina scored 14.600, 0.6 points lower than Izbasa. Their overall scores are 59.566 and 58.833. Fourth placer and US Aly Raisman had the same exact overall score as Mustafina but was dropped to fourth place due to tie breaking rule. The rule indicates that in case of a tie, the sum of the three highest apparatus scores is used, which was found in Mustafina's favor. Izbasa scored higher than Raisman on floor exercise and balance beam. Usually at the Olympic games, at least one of the gold winners has been a World champion in individual events during her competitive career, but that was not the case when it comes to the 2004 Athens Olympics. Team, Balance Beam, Floor Exercise gold medalist. Despite her longevity, Romania's Catalina Ponor who was the most decorated gymnast in Athens, has never won a World title. She competed at four World championships and won three silvers and two bronze medals. 2003: 2nd team, floor exercise, balance beam. 2007: 3rd team, 4th balance beam. 2011: 4th team, 7th balance beam. The Romanian gymnast announced her comeback this year in the aim of making the Rio Olympic team, her coach said to the media that she will most likely not be ready to compete at this year's Worlds (2015). Update: she is expected to compete at the 2017 World championships. Monica is known to be one of best vaulters Romania has ever produced but sadly her career was cut short. As a fresh senior, she went to the 2003 World championships where she won a silver with her team and placed fourth on vault. Struggling from injuries, Rosu failed to make the 2005 Worlds team thus ending her competitive career. 2003: 2nd team, 4th vault. Russia's Svetlana Khorkina who had dominated the uneven bars during her long gymnastics career, was heavily favored to win her third consecutive uneven bars Olympic title, but a fall on a skill she originated opened the door for the French gymnast to achieve her country's first Olympic gold medal in women's gymnastics. Her routine was considered to be one of the most technically difficult bar routines in the world, as she performed a G rated release "full twisting Gienger" and F rated double twisting double back tuck dismount. Le Pennec competed at two World championships and did not win any medal at either competitions. 2003: 11th all around, 5th floor exercise. 2005: 5th all around, 6th floor exercise. Just like Rosu, Patterson had a short career. She competed at only one Worlds which was the 2003 World championships. There, she qualified to the all around final and won a silver medal behind Russia's Svetlana Khorkina whom she beat the following year in Athens in the all around final. But Patterson has a World gold medal in her resume which was won with her team. The gold medal was her country's first in World team competitions. After the Olympics, Patterson took a long break and then retired in 2006. Stroescu and Patterson are the only 2004 Olympic champions who have a gold medal at Worlds in their records. Stroescu's gold medal was won in 2001 in the team competition. She was sidelined in 2002 and 2003, hence not making any of her country's team in major international competitions. She competed at the pre Olympic European championships and was initially not selected to represent her country in Athen. However, Andreea Munteanu who was named to the Olympics, injured herself just two weeks before the competition and Stroescu replaced her. She retired after the Olympics. 2001: 1st team. 7th floor exercise. 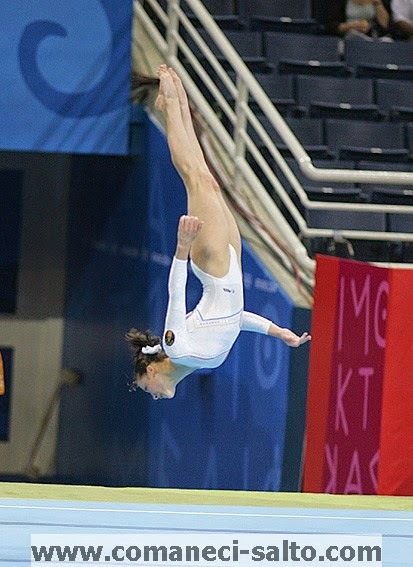 Ban who turned senior in 2002, competed at the 2002 and 2003 Worlds where she earned a silver medal at each competition. Ban had her Olympic experience cut short. She qualified for the all around and floor finals but an injury she sustained on her last event in the team competition forced her to sit out both competitions. She announced her retirement after the Olympics ended. 2002: 2nd: balance beam, 4th: floor exercise. 2003; 6th: all around final. As for the other two members of the 2004 Olympic gold winning team, Alexandra Eremia who also won a bronze medal at the Olympic's beam final, was a part of the 2003 World silver medal winning team. Struggling with fitness, she sat out the 2005 season and retired in early 2006. While Daniela Sofronie who won a silver medal on floor in Athens, never made a World team. 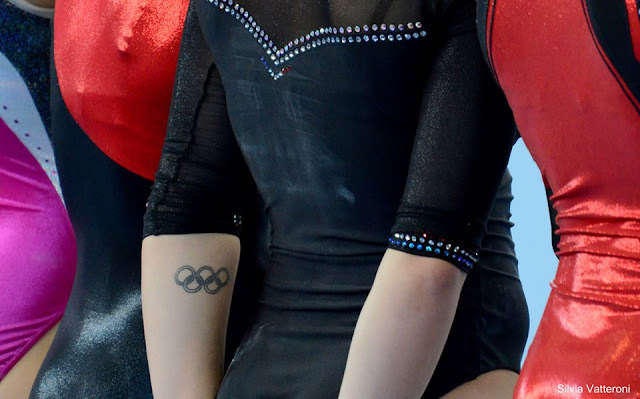 This is one of the most mind blowing coincidences one would expect to see in gymnastics. Jennifer Bricker was given up for adoption right after her birth, because she was born with no legs. Since childhood, she showed great interest in gymnastics. Thus, her adoptive parents helped and supported her to pursue her passion. Bricker chose to be involved in tumbling and later became the tumbling champion of Illinois. When she grew up, she was given some shocking information about her biological family. Olympic gold medalist Dominique Moceanu, the gymnast whom she has greatly admired all her lifeو is in fact her biological sister. As a child, Jennifer looked up to Moceanu and wanted to be a gymnast just like her. The Brickers heard about a girl who was born with no legs, was given up for adoption. Believing that she needed a family, they brought her to their home in a small town in Illinois and raised her in the same manner as they did with their three sons. The only rule in the house was ”Never say the word can’t”. She started tumbling at seven on the trampoline with her dad. By the time she was in high school she became the tumbling champion of the state of Illinois. She also participated in other sports too- like softball or basketball. At the age of sixteen, out of curiosity, she asked her mother what would her last name have been, had she not been abandoned. Their, she knew she is the biological sister of her role model. After the truth was unveiled, Jennifer decided to send Dominique a letter including adoption documents and a photograph. As soon as she saw the letter and the photo, Dominique knew that this was her biological sister- the evidence was clear: Jennifer looked the same as her younger sister Cristine. In the letter, Jennifer wrote that she is an athlete and that Dominique was her inspiration to start tumbling –her childhood idol. 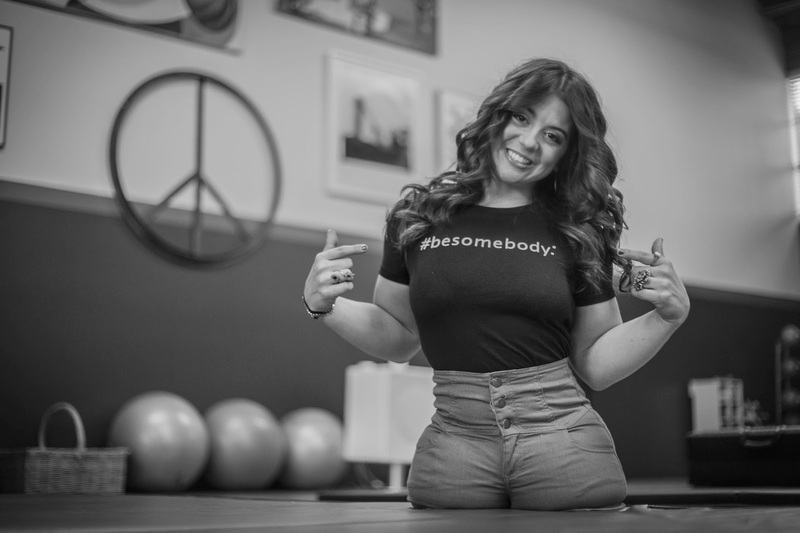 When they first talked on the phone she told her sister that she has no legs. Dominique, pregnant at that time, was shocked, but she doesn’t judge her parents, because it’s hard to say what would anyone else have done, if they were put in the same situation. Her father is the one who decided to give Jennifer to adoption, her mother never got the chance to hold her baby. She was told that the little girl would need special care and they financially could not afford it. Jennifer got to meet both her sisters and her biological mother too. By the age of 21, Jennifer moved to Hollywood to pursue her dream and she earns a living from performing as an acrobat in shows which makes her parents very proud of her. With three gymnasts getting denied a chance to win an Olympic medal in London due to tie breaking rule, a lot of people spoke out against this rule. But no tie breaking rule does not always make everyone happy. During the Moscow Olympics in 1980, five of the six uneven bars finalist medalled, three of them tied for the bronze. Who is the unfortunate gymnast? Nellie Kim of the Soviet Union. With 0.050, Kim lost the chance to tie for bronze. Being the only gymnast in the final to not win a medal, of course she couldn’t be any sadder. At that time, the score of the gymnasts’ performances in the final was not the only score counted as the compulsory, optional and prelim scores were carried over to the final. The gold medal winner was Maxi Gnauck of East Germany, the silver medal winner was Emilia Eberla of Romania and the three bronze medalists were Steffi Kraker of East Germany, Melita Ruhn of Romania and Maria Filatova of Soviet Union. Both Gnauck and Emilia Eberla earned perfect ten in the optional competition. It was the first perfect ten for Gnauck and the only for Eberla. For Kim, the Moscow Olympics was not a disappointment as she left it with two Olympic gold medals, the first one with the team and the other on floor.